Part of a series of volumes for organic chemists in industry, this work presents critical discussions of widely used organic reactions or particular phases of a reaction. The material is treated from a preparative viewpoint, with emphasis on limitations, interfering influences, effects of structure and the selection of experimental techniques. Numerous detailed procedures illustrate the significant modifications of each method. The volume includes tables that contain all possible examples of the reaction under consideration. Lithioalkenes from Arenesulfonylhydrazones (A. Chamberlin & S. Bloom). The Polonovski Reaction (D. Grierson). Oxidation of Alcohols to Carbonyl Compounds via Alkoxysulfonium Ylides: The Moffatt, Swern, and Related Oxidations (T. Tidwell). 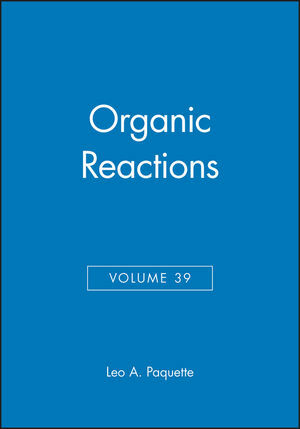 Chapter and Topic Index, Volumes 1-39.